Wiliam Barak was an Aboriginal artist and an important cultural leader for Victoria's Indigenous community. After Simon Wonga died in 1875, he took on the struggle to keep the land at Coranderrk. He also worked hard to keep the local Indigenous customs and stories alive throughout his life. 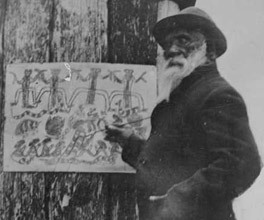 At Coranderrk, where Indigenous ceremonies and corroborees were banned, Barak used his paintings to teach and lead his people, passing on what he knew of Aboriginal history, religion and customs. His brush and his colours were crude, the colours being pigments from the earth. Notwithstanding this, some of his pictures are to be seen in the museums of Europe. Sayers, A 1994, Aboriginal artists of the nineteenth century, Oxford University Press in association with the National Gallery of Australia, Melbourne, Vic. Although Anne Bon was a friend of Barak's, her use of the biased word ‘crude' suggests that materials used in Indigenous art were considered primitive by Europeans at the time. Barak only painted Aboriginal scenes depicting sacred ceremonies and spiritual stories unique to his people. He focused on two aspects of traditional life: corroborees, and groups of Indigenous people wearing possum-skin cloaks which identified them as Wurundjeri. Barak's focus on corroborees allowed him to show Indigenous and non-Indigenous people how these ceremonies took place. In 1887, the Victorian Governor, Sir Henry Locke, asked to see a corroboree but the Aboriginal Protection Board wouldn't allow it. Barak is one of many Aboriginal artists – including Tommy McRae – who used his artwork to help non-Indigenous people better understand and respect Aborigines and their way of life. But for the people of Coranderrk, Barak's art was also a particularly important link with their culture. In 1998, a 19th century British squatter's observations led to the failure of the Yorta Yorta's attempt to reclaim their land.